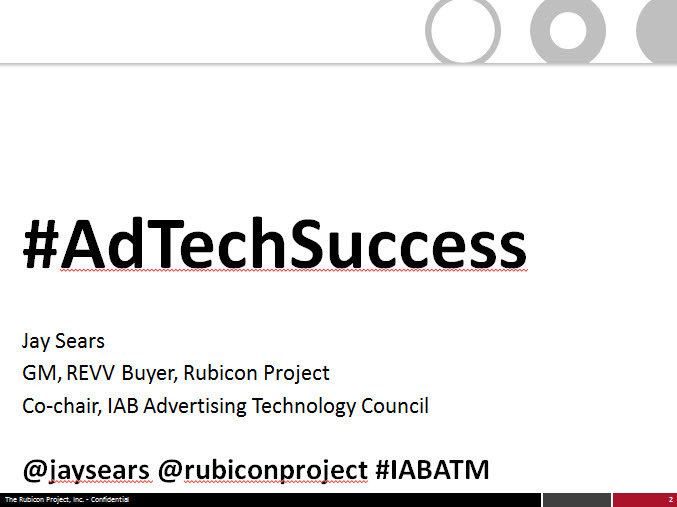 The following was delivered as a speech at the IAB Advertising Technology Marketplace on Monday, July 15, 2013. 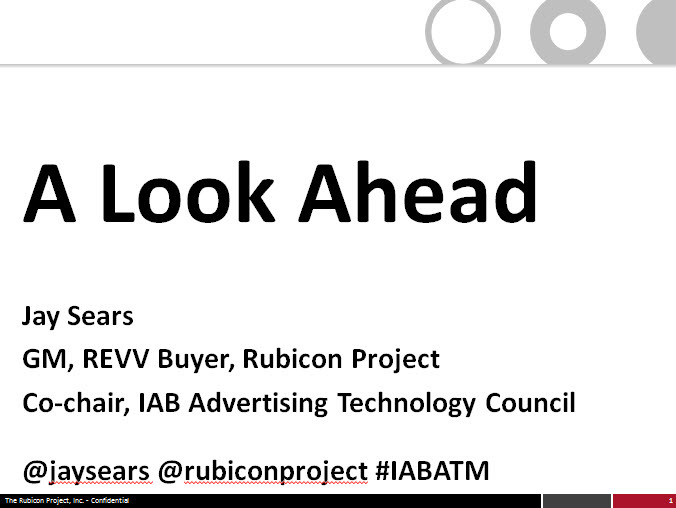 This morning we are going to talk about “A Look Ahead”. This is going to be an interactive session, so be sure to tell us what you think. Before we start, I’d like to ask each of you to go onto your Twitter account. I may be the first speaker who actually wants you to look at your phone. Now, we all know we are in the midst of the consolidation of the ad technology ecosystem. 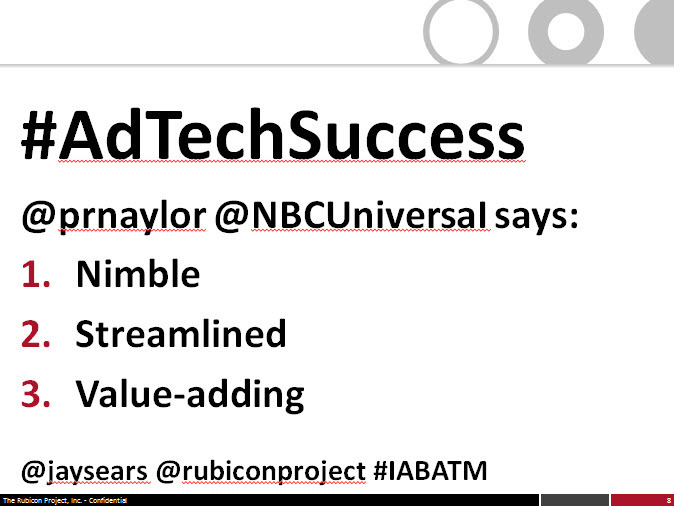 Using your Twitter account and #AdTechSuccess please tweet three words that describe the characteristics of those ad technology companies that will survive as successful and flourishing enterprises. Not company names. I don’t want company names. Hash tag #AdTechSuccess and three words only that describe the characteristics of those ad technology companies that will survive as successful and flourishing enterprises. 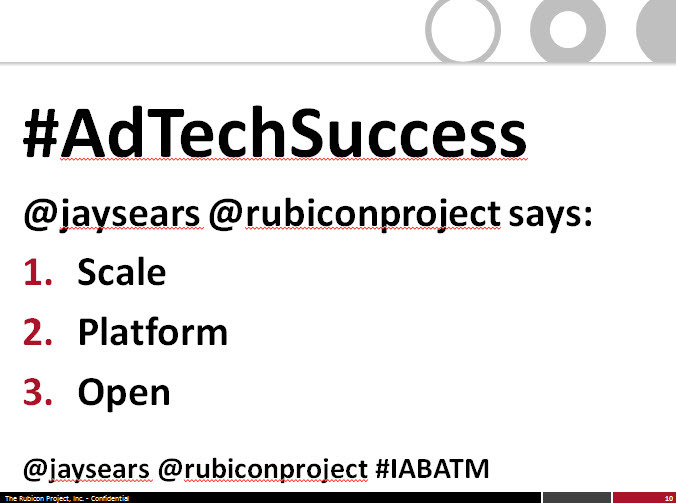 Be sure and include #AdTechSuccess so we can find and aggregate your contributions. Innovation. You are all innovators. And market innovation most typically comes from the bottom of the market and works itself “up the stack” or up the value chain. The Nasdaq stock market. It was first used to trade penny stocks and now trades the finest listed companies in the world. Sabre systems. It was first used for American Airlines to trade unsold seats on their airline and now trades all inventory from airline and hotel brands. Today, eBay motors sells a new car every minute. Now these are examples of innovation we need to embrace. From a used Pez dispenser to a shiny new car. Now, what does this mean for ad technology? We have been busy automating the bottom 20% of the advertising market. Remnant. We’ve transformed the way advertising is bought and sold. But we have only transformed 20%. And truth be told is programmatic – RTB – and auction markets – have many of the ad tech folks in this room speaking with each other—and NOT with the actual buyers and sellers. Now the mechanics of ad technology—for all the confusion—works pretty well these days. That’s good news. But, like I said, now we need to automate the rest of it. The $3.3 billion RTB US display auction market is a small fraction of the overall digital market and a comical rounding error of total global advertising spend. We need to think A LOT bigger. 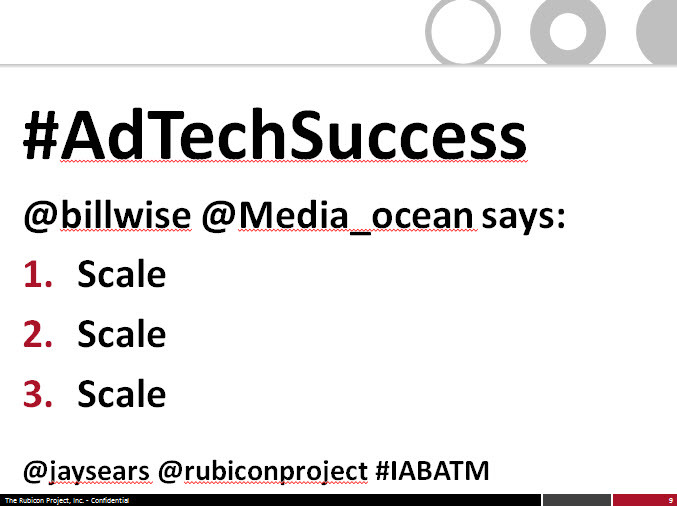 I asked each of you a minute ago to take out your phones and tweet using hash tag #AdTechSuccess three words to describe the characteristics of those ad technology companies that will survive as successful and flourishing enterprises. Now, I have another tweeting assignment. Using the hash tag #AdTechFail, tweet three words that describe the characteristics (not names of companies but the characteristics) of those ad tech companies that will perish or otherwise be subsumed. Hash tag #AdTechFail. Tweet three words that describe the characteristics of those ad tech companies that will perish or otherwise be subsumed. Interpublic Group and its Mediabrands group are thinking bigger. 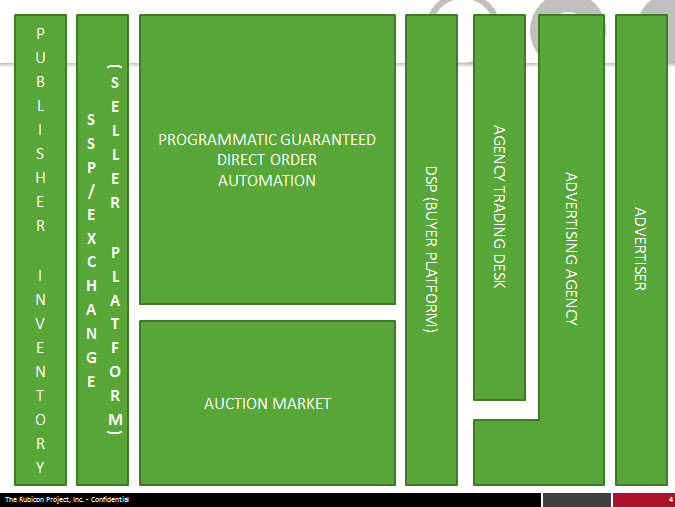 Matt Seiler and his team have said publicly they will automate a full 50% of media buying over the next three years. Not 50% of display. Not 50% of digital. 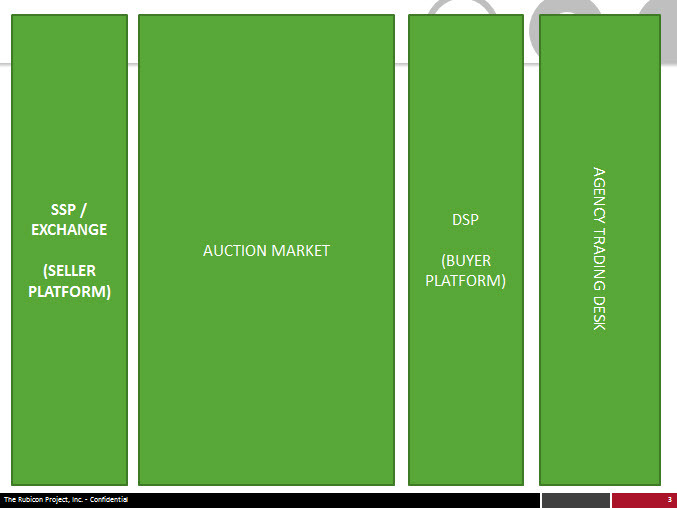 50% of all media buying. Each ad holding company is having the same discussion. How to bring the benefits of automation not just into their trading desk units but into the broader expanse of their operating agencies. Notice the prominence of sellers and buyers—of publishers and advertisers. Many an ad technology executive, usually one at a small, emerging, overcapitalized, unprofitable company with an alpha stage product has taken to Twitter or the trade press and declared the death of sales people, of media planners, of media buyers. We need to empower people. We need to empower sellers. We need to empower buyers. We need to push the technology down and pull the buyer and seller closer together. Notice the prominence of direct deal automation. First is programmatic. All of us should be thinking about the deployment of programmatic into direct selling and buying. The best, most premium packages on the best most premium properties. The best, most premium brands looking for deep engagement in the best environments. It does not sound like how most of us talk today. But these types of words describe our future. 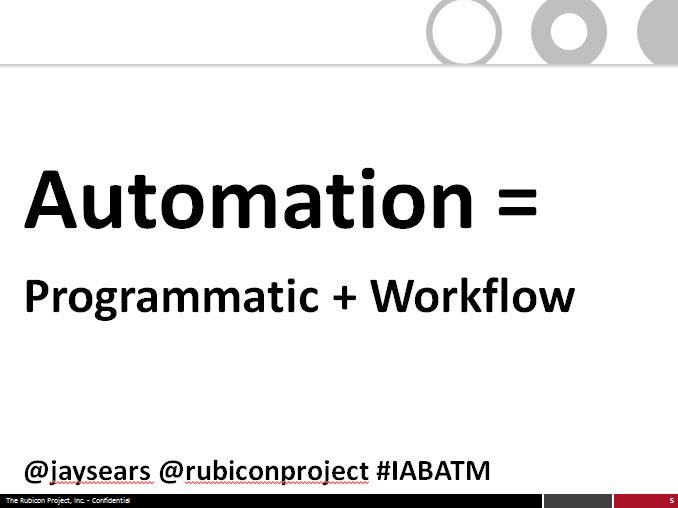 The second component of automation is workflow. The PEOPLE. The enablement of buyers and sellers. We are not talking about our platforms and products being used by programmatic specialists that talk ad tech geek speak. We are speaking about global workforces of the ad holding companies. We are speaking about massive sales organizations of the very top comScore publishers. If your company is not already down the road in these areas, you are already in the rear view mirror of the market. In fact, other markets across the world—including the United Kingdom, France, the Nordics and Australia are ahead of the game and moving fast. The LumaScape chart. Terry Kawaja introduced the LumaScape chart at this conference just a few years ago. Since then it has been downloaded 500,000 times. 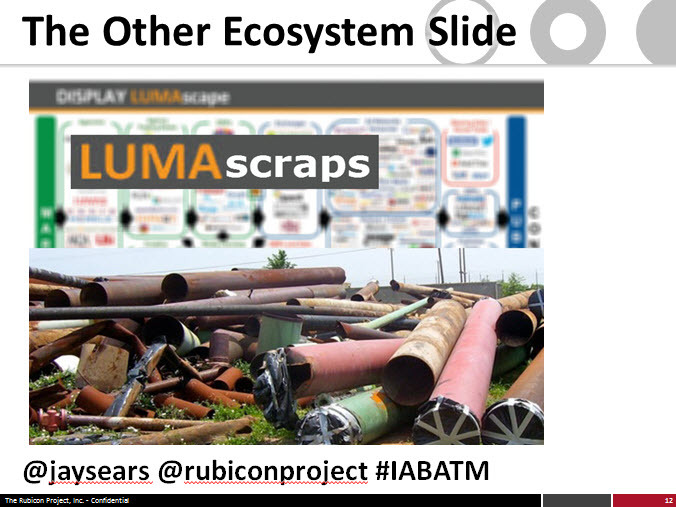 Never before has a PPT slide generated so much investment banking fee revenue. 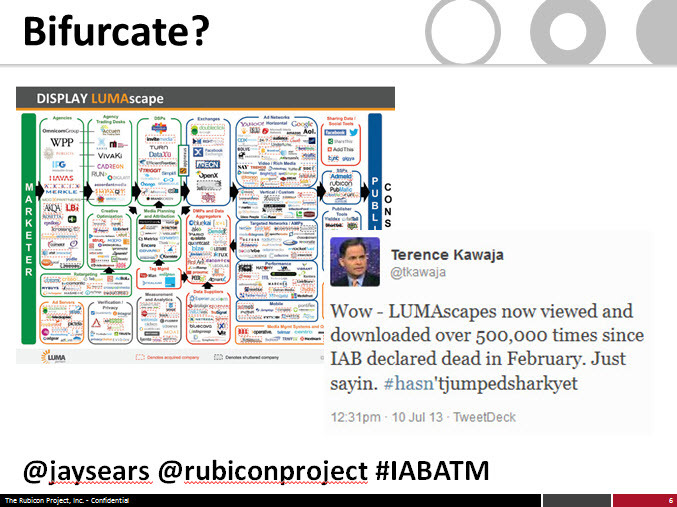 Maybe we can ask Terry to bi-furcate the LumaScape chart. We need a chart of the consolidators and the “consolidate’es”. Of the winners and the ones that will fade away in that rear view mirror. We need a LUMAstars chart. I asked Terry what his three words would be to describe the characteristics of those ad technology companies that will survive as successful and flourishing enterprises. I asked Peter Naylor of NBC Universal. Peter also serves on the Board of the IAB and has served as its Chairman. He also serves as the Treasurer of the OPA. I asked Bill Wise of Media Ocean, who always has a way of emphasizing his point. 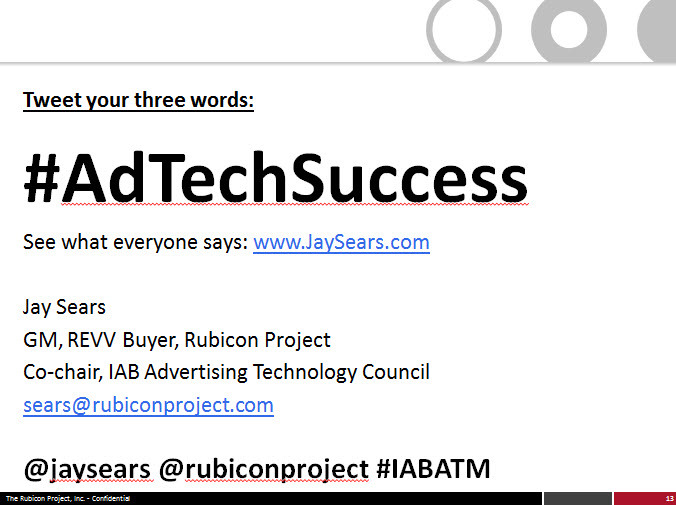 To keep this conversation going, I have asked twenty different leaders in the ad technology space their views on the words describing Adtech Success and the words describing Adtech failure and I have posted their answers on my blog, jaysears.com. Please look at what each of them have to say and join the conversation. Take the three characteristics as described by me, Bill Wise or Peter Naylor. Or go online and see what others including Jonathan Bellack of Google, Penry Price of M6D, Steve Katelman of Omnicom Media group, Pete Stein of Razorfish and Mitch Weinstein of Universal McCann have to say. Take the characteristics you believe embody the companies that remain as successful and flourishing enterprises. 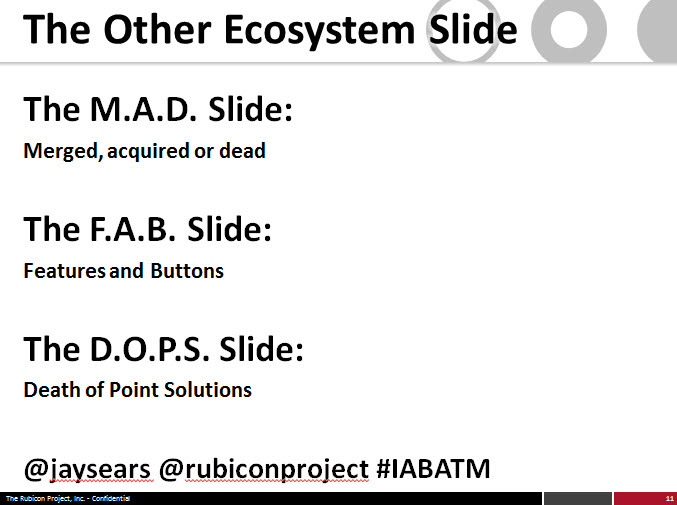 What are you doing to make sure you and your company decorates the new PPT slide of the winners in our ecosystem? And there has to be the other list, of the companies that fade into the rear view mirror. 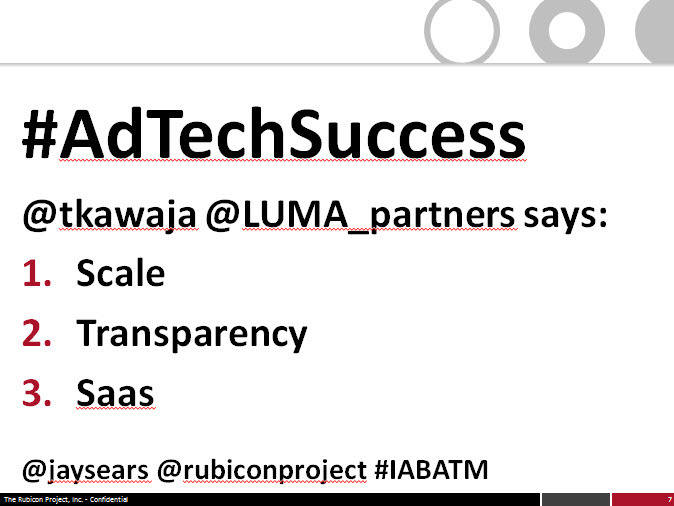 I’ve posted a list of attributes that various ad tech leaders believe describe those companies too. There is a massive opportunity in front of our industry and in front of each one of us.